Lord mayor of London; born in London in 1811; died there Oct. 9, 1889. He was a son of Samuel Phillips, tailor, and was educated at Neumegen's school at Highgate and Kew. 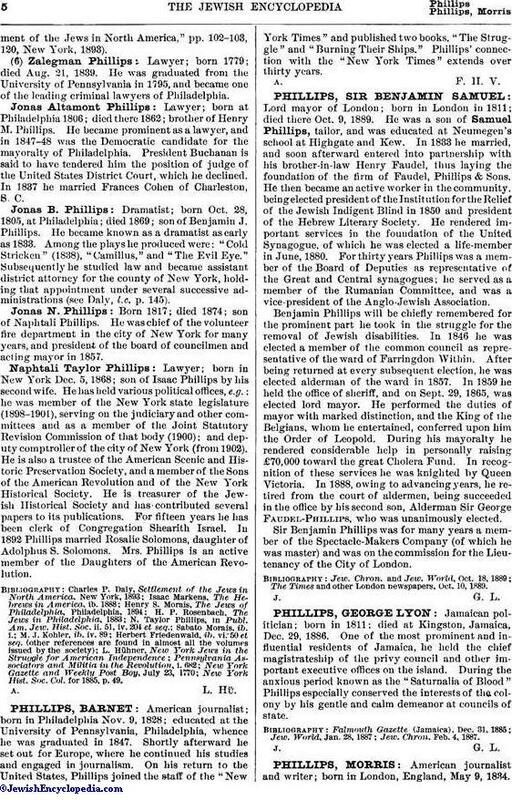 In 1833 he married, and soon afterward entered into partnership with his brother-in-law Henry Faudel, thus laying the foundation of the firm of Faudel, Phillips & Sons. He then became an active worker in the community, being elected president of the Institution for the Relief of the Jewish Indigent Blind in 1850 and president of the Hebrew Literary Society. He rendered important services in the foundation of the United Synagogue, of which he was elected a life-member in June, 1880. For thirty years Phillips was a member of the Board of Deputies as representative of the Great and Central synagogues; he served as a member of the Rumanian Committee, and was a vice-president of the Anglo-Jewish Association. Benjamin Phillips will be chiefly remembered for the prominent part he took in the struggle for the removal of Jewish disabilities. In 1846 he was elected a member of the common council as representative of the ward of Farringdon Within. After being returned at every subsequent election, he was elected alderman of the ward in 1857. In 1859 he held the office of sheriff, and on Sept. 29, 1865, was elected lord mayor. He performed the duties of mayor with marked distinction, and the King of the Belgians, whom he entertained, conferred upon him the Order of Leopold. During his mayoralty he rendered considerable help in personally raising £70,000 toward the great Cholera Fund. In recognition of these services he was knighted by Queen Victoria. In 1888, owing to advancing years, he retired from the court of aldermen, being succeeded in the office by his second son, Alderman Sir George Faudel-Phillips, who was unanimously elected. Sir Benjamin Phillips was for many years a member of the Spectacle-Makers Company (of which he was master) and was on the commission for the Lieutenancy of the City of London. The Times and other London newspapers, Oct. 10, 1889.